This Leslie’s Illustrated cartoon applies the common circus analogy to the 1864 presidential campaign. 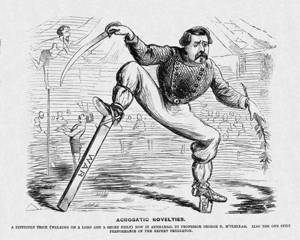 In the foreground, Democratic presidential nominee General George B. McClellan is an acrobat having difficulty walking on two drastically different sized stilts labeled “War” (left) and “Peace” (right). He also carries a sword in one hand (left) and an olive branch in the other (right). The image lampoons the contrast between McClellan’s position as a War Democrat and the national Democratic platform’s inclusion of a peace plank calling for a ceasefire and negotiated settlement of the Civil War. In the background, preparing to jump off a stilt is Democratic vice-presidential nominee George Pendleton, a Peace Democrat.